There are two watercolor techniques that can be used to create watercolor surprise Easter Egg art for kids using our FREE Easter Egg printable template. 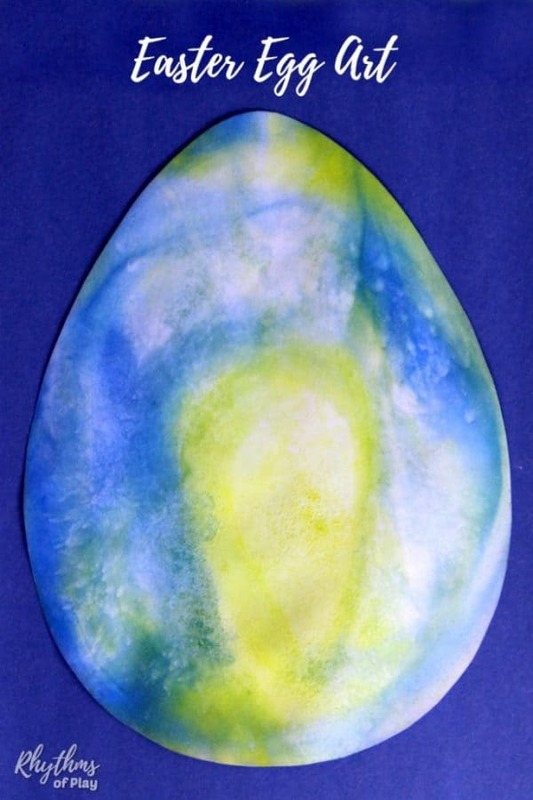 One watercolor art technique uses a watercolor resist medium on the Easter egg art template while the other uses the wet-on-wet watercolor painting method. This easy Easter art project can be completed either at home or in the classroom. 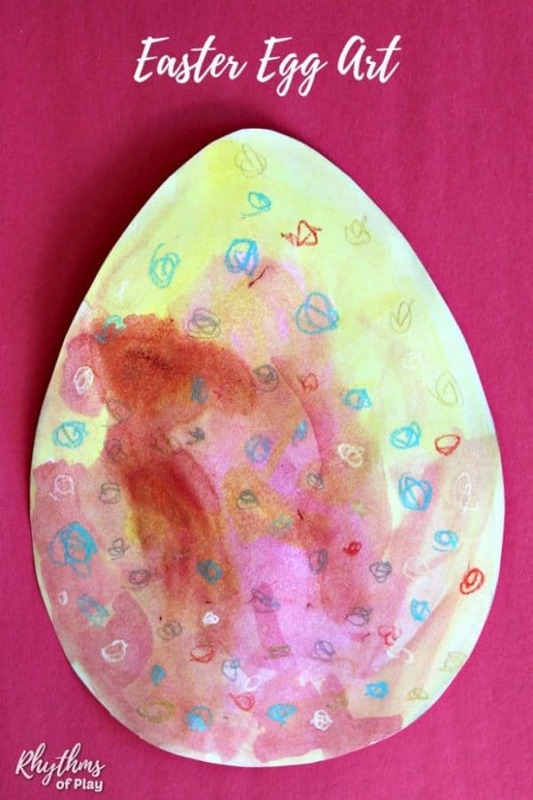 Invite your children to paint watercolor surprise Easter egg art to see what magically appears! These watercolor Easter egg art supplies can be used to paint Easter eggs with either the watercolor resist method or the wet-on-wet watercolor painting method. You will only need to use a watercolor resist medium if you are choosing that method of watercolor painting. Creating watercolor surprise Easter egg art using a watercolor resist medium is a fun and easy Easter art project for kids (and adults!). First, print the FREE Easter egg Art Template and invite children to use crayons or oil pastels to draw designs on the Easter eggs. Next, paint Easter Eggs with watercolors to see the surprise Easter art magically appear! 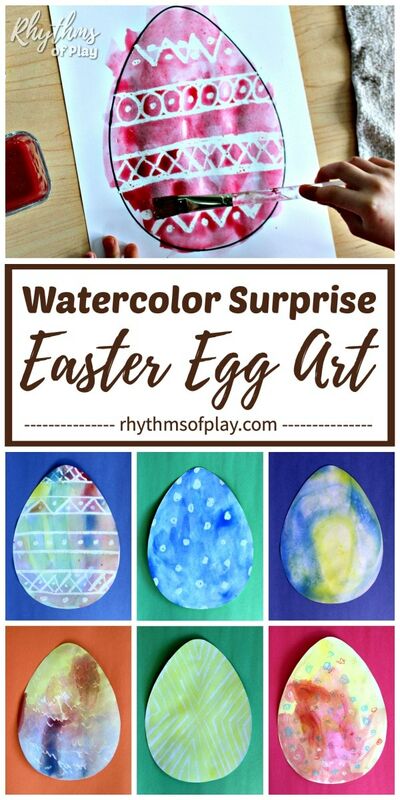 For even more watercolor surprise fun, invite children to draw designs for each other, either at home or in the classroom, to make double surprise Easter Art. Surprise siblings, friends, and even mom or dad with hidden art! Or, you can use a heart shape to make Watercolor Surprise Heart Art. You can even write messages to someone you love in your heart art… Just click on the link for all the DIY details. There is even a video you can watch to see this watercolor technique in action! Invite the kids to draw an egg or print the FREE Easter Egg Template onto heavy cardstock. Cut Easter Egg template out to trace onto watercolor paper OR draw and paint directly onto the cardstock. 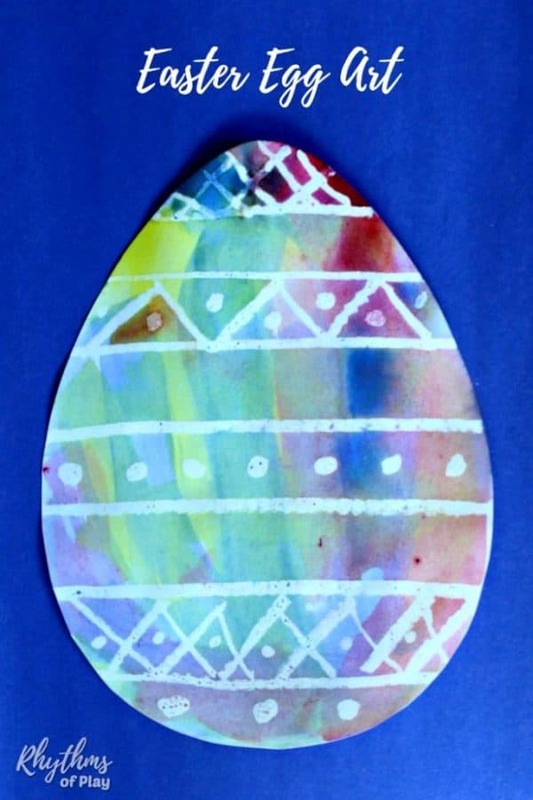 Use crayons or oil pastels to draw designs on the Easter Egg Printable. All colors work, but only white will create hidden surprise Easter Egg art. Invite children to paint Eggs with watercolor paint to reveal the hidden surprise designs! Allow Easter Egg art to dry. We painted with only the primary colors (red, yellow and blue) to encourage color-mixing and experimenting. You are welcome to use more than the primary colors if desired. Learn more about working with watercolors in wet-on-wet watercolor painting. 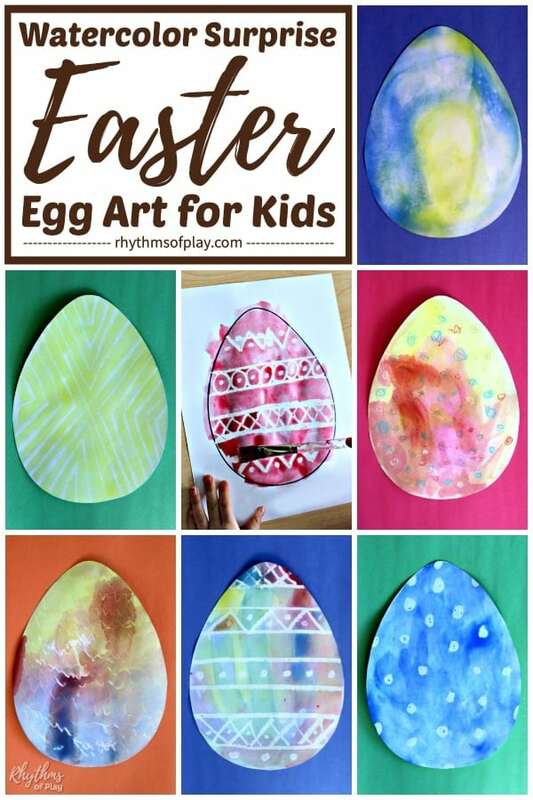 Making designs on the Easter egg template with colored crayons and pastels creates colorful designs that the child will be able to see before they paint with watercolors. Drawing only with white makes the designs hard to see before the child paints. You can see my daughters experiment with colored pastels and watercolor paint in the photo below. When children use watercolors to paint an area that is colored with white crayon or oil pastel they are surprised to see the drawings appear, even when they know the art is there. It’s magic… Invite the kids to experiment and have fun! We like to use white oil pastels because we like the way they work as a watercolor resist medium. Create an experiment with watercolor resist mediums to learn which watercolor resist medium you like best! The second way to create watercolor surprise Easter egg art is to use the wet-on-wet watercolor technique. For best results, use only two primary colors for each egg and watch the surprise color appear! The surprise is revealed when children discover the magical third secondary color that is created when two primary colors are mixed. Painting with watercolors in this way allows children to experience that blue and yellow make green, or red and yellow make orange, or red and blue make purple. As an example, my daughter used yellow and blue to paint the egg pictured below. You could also call this type of Easter art color mixing Easter art, but I think “surprise” is more fun for the little ones. Besides, who would want to spoil the surprise by telling children that they will be doing color mixing? Shhh… it’ll be our little secret. Invite children to draw an egg or print the FREE Easter Egg Template onto heavy cardstock. Cut the Easter Egg template out to trace onto watercolor paper OR draw and paint directly onto the cardstock. Hop on over to learn more about wet-on-wet watercolor painting if you would like to try creating surprise Easter Eggs using this technique. The article explains soaking the paper first. Another option is to use a spray bottle filled with water to get the paper wet and then wait a few minutes to paint. NOTE: The Easter egg art template ink runs a tiny bit when you spray it with water. However, it is possible to cut the egg out when it’s dry for a cleaner look like the Easter Egg pictured above. Another option is to cut the egg out before spraying it with water. 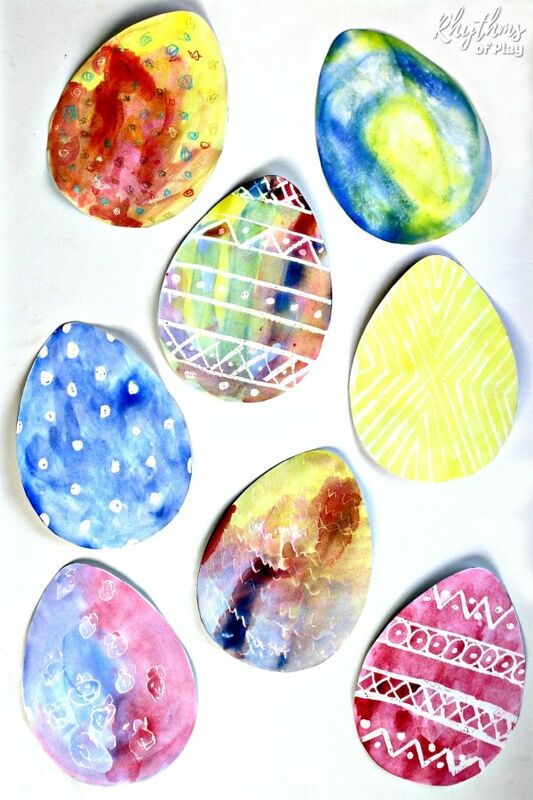 Try either of these fun ways to create watercolor surprise Easter egg art with the kids this spring. Don’t forget to hop over to have a look at all of the other amazing Easter Art Project Ideas kids LOVE! If you have ever wondered how Easter eggs or Easter baskets came to be associated with Easter, find out in Easter Traditions to Start with Your Family. We have uncovered some interesting theories to share with you. You may also like this collection of Fun Art and Craft Ideas for Kids, and our Spring Bucket List Seasonal Activity Guide filled with fun activities to try with the kids this spring!